“Palestine refugees” have been exceptionally indulged by the international community for 70 long years. Consider the ways: They should not even have been classified as refugees, they had the unprecedented benefit of a relief agency created exclusively for their welfare (the United Nations Relief and Works Agency, or UNRWA), and they uniquely can pass on the “refugee” status to future generations. Rather than help resolve the Palestinian refugee problem, these unique benefits have served to confirm the permanency and growth in the refugee problem (what started as less than a million is now over 5 million). No organization has contributed more to this perpetuation than UNRWA, which, instead of ending direct relief and transferring responsibility for the refugees to the host Arab states within months, as stipulated by its mandate, has kept them as passive welfare recipients for decades under false humanitarian pretense. 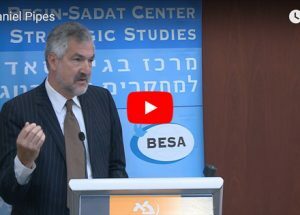 On March 18, the Begin-Sadat Center for Strategic Studies and the Middle East Forum convened an international conference “Reforming UNRWA,” which considered existing problems and suggested realistic solutions.